It is the new rage, the new black, in fact, the best way to play at an online casinos. This is Live dealer blackjack from best of breed British online brand – Bet365. Blackjack is popularly played all over the world, and now what better place to play, than in the comfort of your very own home? Beautiful live dealers are waiting to offer the chance to test your playing skills, in the environment where you most feel at home. Bet 365 is a full service casino, and the seventh largest privately owned company in the UK. Blackjack playing fans can rest assured that their live online gambling is in expert hands. The company employs over 2000 people, and are licensed offshore in Gibraltar, as well as being regulated by the UK Gambling Commission. Seven million fans can’t be wrong! There is always a seat at these exclusive, branded Bet365 baize tables, in games where 21 is the winning number. With the highest quality video streaming, Playtech has definitely come to the “quality” party with the software platforms for these real-time games. Video is filmed in a TV-like studio, streamed at the same time the cards are dealt. These blackjack cards are being dished out by some of the best looking croupiers on the block. Both Euro and Asian blackjack games are live-streamed, and in fact the first live online bets were taken in the Playtech Asian (Manila) studios backin 2007; European studios went live in 2009 from Riga in Latvia. Oversized playing cards ensure that the deal can always be seen in clear view. Both the removal of the old card shoe from the table, as well as the loading of the new, can be seen clearly on the video stream. Table limits generally start at around 1.00 per hand, but additional betting options are also available. High rollers are able to contact the casino directly, and have limits set at higher levels, and there are options to wager up to 2500.00 per hand. Lower limits can also be found, but not usually in live dealer games. No free gaming is allowed in live-dealer blackjack, but then live players are usually serious gamers. 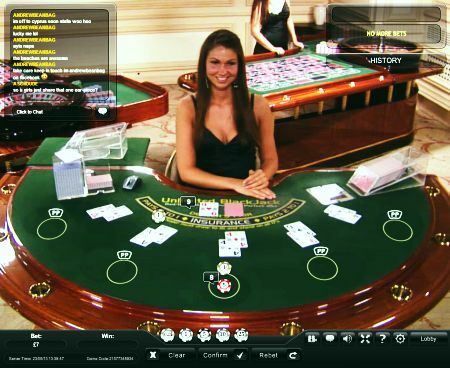 It is good to note that online blackjack can be played in demo mode for the player to hone their skills. Pay-out percentages are audited and certified safe and fair by TST Incorporated, and no simultaneous table play is allowed. Dealers are able to chat with players, and this type of blackjack can be played on the go from an iPad, or iPhone. Multiple currencies, languages and payment methods are supported, while 24/7 customer support sees that customers’ needs are taken care of 24 hours a day, 7 days a week, and 365 days of the year.